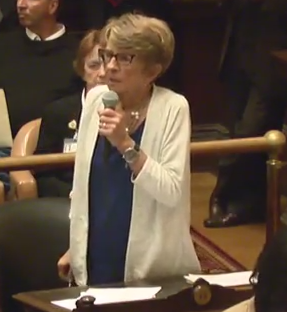 A screenshot of Councilwoman Mary Pat Clarke speaking at a October 16 City Council meeting. Oct. 25 preview of city council committee hearing on Dollar House Program. In the 1980s there were efforts to condemn blocks of vacant, historic homes in Otterbein and Ridgely’s Delight. But then, the city came up with the Dollar-A-House program to salvage those homes and revitalize those neighborhoods. Clarke sponsored of the resolution to bring back the program. She says those low interest loans would be used to restore and revitalize the houses within a certain period of time. “And if you didn’t, you couldn’t take title to it," says Clarke. But once those houses were revitalized the program went missing-in-action. Clarke says she doesn’t know why. Today a local neighborhood group called “H.O.M.E.S”—Homeownership, Opportunity, and Mentorship for Economic Success—wants to use the same idea to revitalize neighborhoods overcome by vacant homes and blight. Bost says he wants working class families in Baltimore to be given more opportunity to be homeowners. “Let the working class have that loan that they’re going to pay back to you," says Bost. But given Baltimore’s declining population, the blight and the crime rate, will the program incentivize people to move to Baltimore? There is one element that wasn’t there 30 years ago that Bost says will help. “It’s going to take electricians, plumbers, and brick masons to put these houses together," says Bost. Bost--a master plumber, HVAC tech, gas fitter and certified pipe welder among other things--says he wants to promote a program of apprenticeships through court-ordered diversions to revitalize the homes and keep some juvenile offenders from going to jail. Councilwoman Clarke, who has the backing of the entire council, says it’s a grass roots effort; "from the neighborhood for the neighborhood." She says the program gives residents, rather than developers, a say in the development of their own communities. But there is one big problem, Clarke says there’s no money available for low interest loans for rehab work. So how else can the program be implemented? The city could float a bond at a low interest rate and use that money for the loans. Or, the city might tap into the U.S. Department of Housing and Urban Development’s dollar-a-house initiative. But Clarke fears that might not be an option, given looming potential massive cuts to the 2018 federal budget. So, it’s likely funding the program may be the main topic of debate for the council’s housing and urban affairs committee tonight.